Sirplay will present R-PLAY at ICE London 2019 to the audience in London. We already presented our newest integrated Sports Betting Software in New York for the Sports Betting Conference. Sirplay is always happy to participate Clarion Events’ trade shows. Not just because Clarion brings good luck. In truth, every event allows Sirplay to approach local and foreign entrepreneurs, who show interest in the Sports Betting and Gaming Industry. We want to repeat ourselves this year at ICE London. Last year, we had a literal crowd of people interested in our way of seeing the business and the solutions related to the World of Gaming and Sports Betting. And this is why Sirplay is proud to be at ICE for the fourth consecutive year. ICE London grows with Sirplay and we cannot be more than enthusiastic. Let’s jump to Sirplay and what will happen in the coming weeks. A potential of ​​33,000 People attending the event, and organized tours for Sports Betting. Sirplay would like to publicly thank Clarion for the opportunity given to the sector to gather and benchmark. For 2019, Sirplay’s target is to meet people who are really willing to discover R-PLAY. Because R-PLAY is not just a platform, but Sirplay’s vision of Sports Betting and Gaming. R-PLAY is our latest product, an Online Gaming Platform not only designed to accommodate impressive numbers. Above all, R-PLAY aspire to accommodate the most demanding Operators in the market. ICE London 2019 will be the next stage in which R-PLAY will be presented and staged for demo. The R-PLAY offer consists of Fast and Reliable Sports Betting. This is presented in the standard format for Operators in every country in which Gaming is an integral part of Entertainment. R-PLAY offers the possibility to offer Fixed Odds bets, as well as a very advanced Live Betting in its genre that provides the bettors with the comfort of the most modern platforms. Statistics, Live Updates and all the Front End designed for bookmakers and players. Therefore, If you have no idea what we’re talking about, you can take a look at R-PLAY, the platform we presented at ICE New York 2018, follow this page or check out the demo of the platform presented at ICE London! The expectations for ICE London 2019 are very high. We cannot wait February 5th to show R-PLAY to as many people as possible. We hope to receive the same feedback collected at ICE New York in November and to successfully return home as at the fair that Sirplay attended in November. Doing Demo at ICE London is a prerogative! The Sports Betting industry has more and more players willing to do anything for their products. Sirplay thinks that doing Demos, and seeing satisfaction in people’s eyes is the best form of strength for a Sports Betting Software. 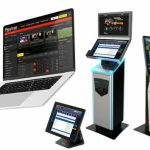 Another objective is obviously to increase the Brand Awareness of our Sports Betting Platform and Sirplay’s in general. Finally, we want to demonstrate European customers and those who think that Sirplay is only South America, the capabilities of Sirplay Sports Betting products and Platforms. We hope to see you at ICE London!